This is a small Craftsman articulated, folding, 1-foot rule. The rule is made of wood with brass hinges and ends. It folds to about 3.5 inches, so it is meant to be pocket-size. 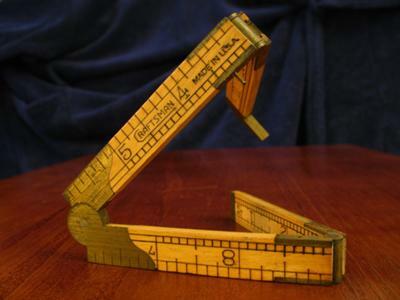 It has measurement markings in Inches, Halfs, Fourths, Eighths, Twelths, Sixteenths, and Thirty-secondths (1/32 marks are only on an embedded pull-out brass slide). Marked with "CRAFTSMAN" (logo) and "MADE IN U.S.A." I have no idea how old it is.